Growing up in the old Soviet Union I remember getting up in the morning listening to the radio station my family liked. Right around the time I had to leave for school they had a program where the announcer would say: “And now, due to the overwhelming number of requests by our listeners we will play Such-and-Such by So-and-So”. 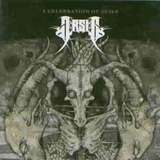 Funny enough, I was going to review Arsis A Celebration of Guilt at some point. But, “due to the overwhelming number of requests” by our readers I thought I would move it up in the order. Yet, whatever I decided to share below has nothing to do with the “number of requests”, as I feel it would be unfair to cave in to the pressure. So, with a week and half in my player and about 6 listens under my belt I am ready to form an opinion. If you like extreme metal you may get your fix by digesting all of its ingredients separately. A dash of death metal, a pinch of thrash, a drop of black. The food pyramid is slowly building up, or you can take one supplement pill, and get all of your nutrients at once. Arsis is such pill. Blending all of the above styles in the nail-spiked puree, this band from Virginia, of all places, delivers with a bang. Moreover, at the end of the album I felt as if I had gone through that same blender. And, even though the blade tips (metal styles) were all different in shape, my brain has been sufficiently minced and pulverized. Or, if I could borrow from Mr. Evil American, one of our readers, A Celebration of Guilt would speed up your pulse or instill you one, if you did not have any. Assuming, of course, extreme metal is one of your favorite dishes. The intentions are declared from the first millisecond of the opener The Face of My Innocence. Clocking at five and a half minutes, this track blasts and runs all over with intense guitar riffs, juicy melodic harmonies and prominent soloing. There is no point on the album where the band lets up. At times, my body and mind started headbanging and twitching uncontrollably. On many songs the drumbeat patterns often change without letting the listener settle in (Seven Whispers Fell Silent, Wholly Night). Michael Van Dyne on drums effortlessly switches from double bass to fast blasting (Maddening Disdain). On one hand, you don’t get to just groove with the flow, but on the other hand, you are always at the edge of your seat. OK, so now we know the album is fast, melodic and aggressive. There is more to it than that, however. The band’s soul, musicwriter, main instrumentalist (everything except drums) and vocalist James Malone managed to create a unique combination of styles. Return has Carnal Forge styled thrash entry, Dust and Guilt has The Haunted fingerprints all over it with raspier vocals and even with a signature middle melodious temporal breakdown. The Sadistic Motives Behind Bereavement Letters has Gothenburg, Dark Tranquillity Skydancer-era leads, and Carnal Ways to Recreate the Heart is blast&tremolo black harmonies with an appropriately higher pitched vocals. I could mention Carcass, Susperia, Dismember influences as well. The label on the disc says not since At The Gates such fine death/black combination has been created. Agreed, and unlike many other, including Scandinavian, bands Arsis does not simply lift off ATG’s riffs. With so many influences, could it be the music on A Celebration of Guilt is Arsis unique style? I think so, and let’s leave it at that. Even the vocals change slightly from song to song. Sometimes they remind me of Johan Liiva (Arch Enemy old vocalist), but James can be both shrieking and sound cleaner as well. With me liking the album quite a bit, and lavishing all kinds of praise on it, why didn’t I give it a >90 score? Arsis only knows two speeds, fast and faster. Their throttle is on “full” all the time. The aforementioned At The Gates knew when and where to slip an instrumental, or a slower meatier song to keep the attention at its very peak. Another reason is the cymbal/high-hat production. I do not think it is very good, as the higher drum kit frequencies often merge into one rustling sound. Willowtip deserves all kinds of credit for discovering Arsis. They would do well to hang on to it, as bigger labels might come rushing in once they realize metalcore high volume sellers are not everything there is to promote.